The Taj Mahal always seemed like the coolest thing. Especially as a 90s kid growing up with Aladdin and Age of Empires. I never thought I’d see it in person someday. It really does feel like you’re stepping into a Disney movie or something! This page will explain how you can visit the Taj yourself, and why you should! The Taj Mahal is a huge monument, palace, and tomb built in 1632 by emperor Shah Jahan for his favorite wife, Mumtaz Mahal. The couple is buried together inside the Taj Mahal. The white marble dome was built by 20,000 artisans and the project took decades to finish. It’s surrounded by a 40 acre garden with pools, fountains, and decorative walls. 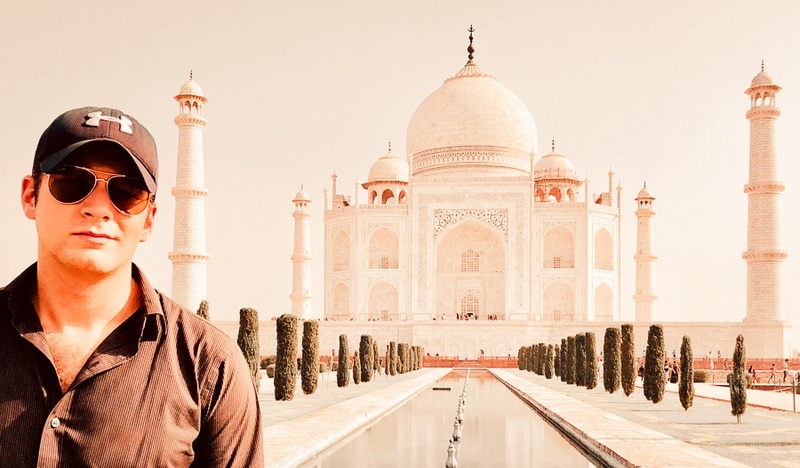 Today, the Taj Mahal is recognized as a UNESCO World Heritage site and “one of the universally admired masterpieces of the world’s heritage.” It gets over 8 million visitors per year. First of all, most nationalities (except for Bhutanese and Nepali citizens) will need a visa to visit India, which is given in the form of an electronic visa (eVisa) since November 2014. This is required if you want to visit India and see the Taj Mahal. It’s not very hard to apply for and get this eVisa to visit India. I wrote a complete guide that explains all of the steps. If you’re on a tight schedule and want to skip the extra steps involved in arranging your own trip to the Taj Mahal, or if you’d rather travel with a tour guide for safety or convenience, there are options for doing that. There are a number of companies that offer private tours in an air conditioned vehicle for as low as $90 USD, with free pickup and return transfers from your hotel in Delhi. If you’d rather make your own arrangements and go without a group, that’s covered next. Where Is The Taj Mahal Located? The Taj Mahal is located in the city of Agra, in the northern state of Uttar Pradesh, India. Agra does not have its own international airport. That means the closest international airport to fly into is Indira Gandhi International Airport (DEL) in New Delhi, which is 140 miles (230 km) from Agra. The 2nd closest airport would be Jaipur International Airport (JAI) in the city of Jaipur. How Can I Get To The Taj Mahal From Delhi? From Delhi (or Jaipur), you can get to Agra by car, bus, or train. I would generally recommend taking the train because it’s safer, cheaper, and faster. The train ride takes about 2 hours and costs 755 INR ($10.75 USD). India as a country does not have a good road safety record (big understatement), and there are plenty of statistics and videos out there that would shock you. That’s the main reason why I opted for the train when I visited the Taj. The only downside of taking the train is that it’s a bit more complicated. Once you arrive in Agra, there are hotels if you want to stay near the Taj Mahal. I would recommend staying at least one night near the Taj, that way you can do everything at a relaxed pace without worrying about going back to Delhi the same evening. I booked a hotel within a 5 minute walking distance of the Taj, and it was super convenient being able to get there and back to my room easily on foot. There are three entrance gates for the Taj Mahal — west, south, and east — but most hotels for foreigners are situated near the east gate. Vehicles are not allowed within 500 yards of the Taj because of pollution, so you will have to walk this last stretch on foot. Prepare to be bugged! There are lots of persistent freelance guides and touts on this street who will try to sell you a rickshaw ride to the gate. With that said, if you come here in the mid-summer heat and you have some spare change, the rickshaw ride may actually be a good investment! There is a pretty strict security process when you reach the gates at the Taj Mahal. No backpacks are allowed, and no items are allowed except for essentials like your phone, camera, and a water bottle. Sadly, other things like food, camera tripods, and phone chargers are NOT allowed. There are luggage storage facilities at the gates, but I didn’t trust these so I brought only my phone and wallet when I visited. The entry price for foreigners is 1,100 rupees ($15.65 USD) as of 2019. The price for Indians is 50 rupees. Children under 15 can enter free. The first thing you will see as you enter the Taj Mahal building complex is a huge gate — the ‘Great Gate’. This is actually pretty impressive, and it’s worth stopping to take some photos. If you still don’t have a guide at this point don’t worry, because someone will come along and make it their duty in life to become your tour guide! One guy in particular followed me around for the longest time and wouldn’t stop bugging me. His persistence paid off and I finally paid him to take a bunch of photos for me. When you walk through the Great Gate, you will finally see the Taj Mahal for the first time. I don’t mean to exaggerate or anything, but I was totally dumbstruck when I walked through the door and first saw the Taj. It’s really breathtaking. My guide was prattling on about some Taj history facts as part of his impromptu tour, but I totally zoned out for a minute and it felt like I was alone with this incredible hunk of white marble! I knew what it was and I had seen it in pop culture many times before, but I never thought I would find myself here. You can go inside the Taj, but you will be required to remove your shoes/sandals and go barefoot, or wear shoe covers. This is to protect the marble flooring since there are millions of people walking through here every year. Sadly you aren’t allowed to take photos inside the Taj, which I assume is out of respect for the dead (remember, it is technically a tomb). The inside is nothing mind blowing, but it’s definitely ornate and fancy just like the outside. I’d give it a quick look. Any month is OK for visiting the Taj Mahal, but the summer months (especially April-July) are not ideal because Agra can get very hot around that time. I went in late May and the temperature was over 110 F (43 C) — like I said, not ideal. But it was still better than nothing! Any time of day is good for taking photos of the Taj, but I think late morning or early afternoon is best. The big marble dome is lit up better at this time, so it shines bright white. The main benefit of visiting early in the morning is that it’s easier to get pictures taken without other people standing in them. Important Note: The Taj Mahal is closed on Fridays. Aside from that, it’s generally open every day of the year from sunrise to sunset.